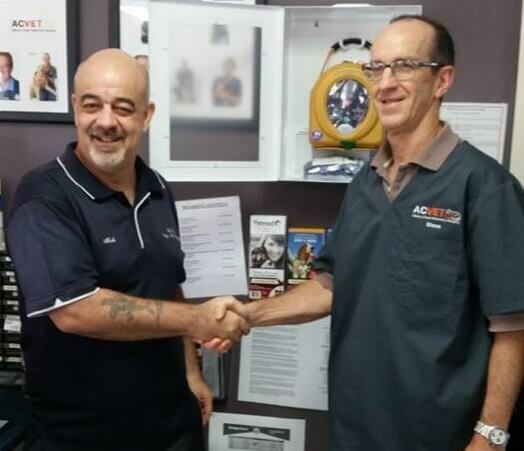 BLS First Aid > Latest News > Defibrillator Provided To Albany Creek Veterinary Surgery! BLS First Aid is a local company, proudly representing the North side of Brisbane. We are very passionate about getting defibrillators into the public, in order to potentially save as many lives as possible. While training The Albany Creek Veterinary Surgery in CPR, they inquired about our HeartSine defibrillators, and we were more than happy to show them the ropes. 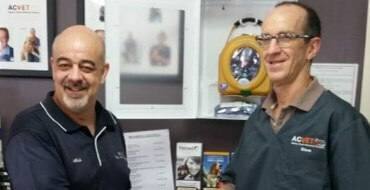 Albany Creek Veterinary are now proud owners of a HeartSine 500p AED, and have now helped make the area a safer place. Each year around 30,000 Australians experience Cardiac Arrest. This equates to one every 9 minutes. Sadly, In Australia, only 9-10% of these 30,000 people who experience Cardiac Arrest will survive. 95% of victims who die, do so before reaching hospital. When an AED (Automated External Defibrillator) is used, along with early CPR, the chance of survival increases drastically to 30-40%. It doesn’t take a rocket scientist to see how important defibrillators are to saving lives. Getting defibrillators out to as many local businesses and public areas as possible is critical to making Australia a safer place. For more information, see our full Defibrillator range.